Are you responsible for your plant's industrial machines? Is My Machine OK? 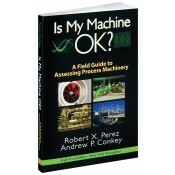 is a compact and handy reference on the potential risks of machine failure and safe machinery operation. Authors Robert Perez and Andre Conkey, aided by several contributors, provide 225 pages in this hardcover guide. It foms a solid basis for reliable and safe machine operations. The authors employ their extensive background to combine the most commonly used assessment tools in a single source. Developed specifically to be taken into the field by machine operators, plant supervisors and maintenance technicians, the guide will also help reliability professionals make informed decisions about factory and process equipment. • Improvement Ideas. Throughout the book there are many relevant examples that will help you better understand the proper application of the various assessment methodologies presented. Robert X Perez has more than 30 years of rotating equipment experience in the petrochemical industry and holds a BSME from Texas A&M University, College Station, Texas; an MSME degree from the University of Texas, Austin, and is a licensed P.E. in the state of Texas. He is a co-founder of PumpCalcs.com, a web-based site for pump-related calculations, and is the author of Operator's Guide to Centrifugal Pumps. Andrew P. Conkey is an assistant professor of Mechanical Engineering at Texas A&M University at Qatar. He has been a member of the Vibration Institute for over 15 years and has conducted research on the application of fiber optic interferometers for machinery rresponse measurements. He earned a BSME degree from Texas A&I University, and MSME and Ph.D. degrees from Texas A&M. Mr. Stark is a licensed Professional Engineer in Texas, with over 15 years of project engineering and management in petrochemical plant design and construction. He earned degrees in Electrical Engineering and Computer Engineering from the University of Missouri at Columbia and an MBA from Texas A&M University at Corpus Christi. Mr. Le Bleu has more than 35 years of experience with critical industrial machinery, including 25 years as the Principal Rotating Equipment Engineer for Lyondell Chemicals in Lake Charles, Louisiana. He earned a B.S. degree from the University of Florida. Mr. Le Bleu is currently teaching machinery best practices to operators and maintenance personnel. Mr. Davis is an established author and recognized authority on Lean Manufacturing. With an extensive background in products ranging from air conditioning and fractional H.P. motors to jet engines, helicopters and elevators, Davis has a broad range of experience in manufacturing and has consulted with numerous leading firms including Brunswick Corporation, Crane Pumps, CertainTeed Corporation, Rowe Manufacturing, JTB Furniture, and Defiance Metal Products.